The FDA issued a guideline in 2005 to assist scientists in converting safe and effective animal doses of therapeutic agents into appropriate human doses (1). This guidance is based on many years of research conducted by many different scientists. The guidance states that in order to convert animal doses to human doses, the difference in body weight and also the difference in body surface area both need to be taken into account. 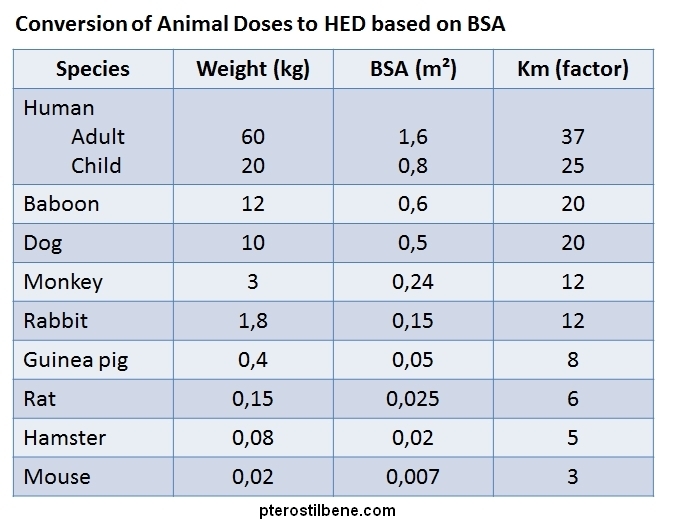 The average body weight and surface area of various common experimental animals (e.g., rats, mice, monkeys) are known, as is the average body weight and surface area of adult humans and children. The FDA’s guidance document provides tables of these known values. The estimated dose for a human is then calculated by dividing the animal Km factor by the human Km factor to produce a Km ratio, and multiplying the effective animal dose (in mg/kg) by this Km ratio. Many animal studies of pterostilbene have been conducted and can be used to establish the safe and effective human pterostilbene dosage. 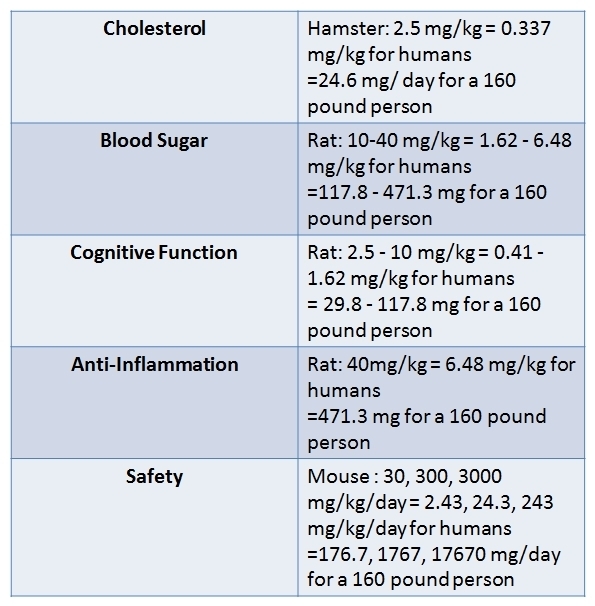 Safety analyses in mice (2) indicate that human doses up to an incredible 17670 mg/day are safe for an average-sized human (160 pounds). Studies of the efficacy of pterostilbene for reducing cholesterol (3) and improving cognitive function (4) in hamsters and rats suggest that the effective pterostilbene dosage for an average-sized human is around 25 to 118 mg/day. For a therapeutic effect on blood sugar and anti-inflammation, studies in rats (5, 6) suggest that the effective dose should be slightly higher, 117 to 472 mg/day. Overall, the animal studies suggest that a human dosage of 50 to 150 mg/day is safe and provides therapeutic health benefits. (2) J Agric Food Chem. 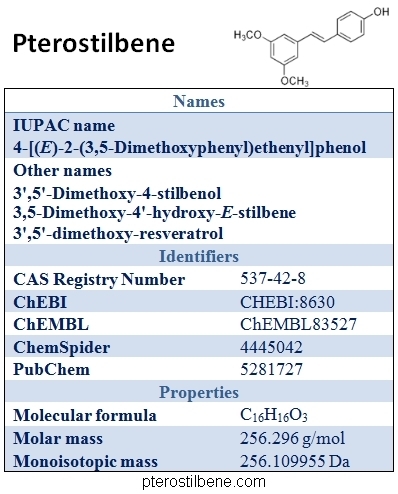 2009 Apr 22;57(8):3180-6. doi: 10.1021/jf803579e. (3) J Agric Food Chem. 2005 May 4;53(9):3403-7. (4) J Agric Food Chem. 2008 Nov 26;56(22):10544-51. doi: 10.1021/jf802279h. (5) Life Sci. 2006 Jul 10;79(7):641-5. Epub 2006 Apr 17. (6) Carcinogenesis. 2010 Jul;31(7):1272-8. doi: 10.1093/carcin/bgq004. Epub 2010 Jan 8.